The University of Southampton is joining a new National Wind Tunnel Facility (NWTF) that will keep the UK at the forefront of aerodynamic and fluid mechanics research. Three Southampton facilities will share in the £13.3 million funding for the NWTF, with £10.7 million coming from the Engineering and Physical Sciences Research Council (EPSRC) and £2.6 million from the UK Aerodynamics Centre. The NWTF consists of 17 different facilities, including three in Southampton, spread across seven universities throughout the UK. The Facility will support research addressing problems in many sectors but with a primary focus on aerospace research, a key contributor to the UK’s GDP. The facilities will be available for use by researchers and industry and will be able to simulate a wide variety of environments to build understanding of both low and high-speed conditions. 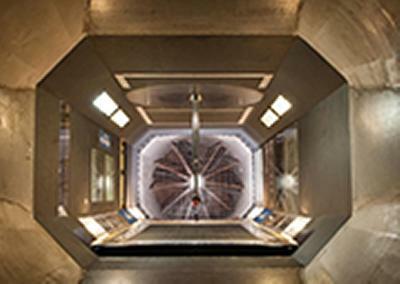 The funding for Southampton will provide an upgrade to the R. J. Mitchell wind tunnel, including a laser diagnostics kit, plus two new facilities, which are unique to the UK and Europe, at the University’s new Boldrewood campus – a 138m long towing tank and an anechoic wind tunnel.